Meanwhile, Brenner’s dopey friend “Chewy” Cooper (Kevin James) is President of the United States. That’s right, Kevin James plays the President of the United States. And a terrible one at that. When the space time capsule is intercepted by aliens, causing them to misinterpret the arcade game competition as a declaration of war, Cooper hires Brenner and fellow gamer Ludlow (Josh Gad) to fend off pixelated 8-bit video game characters who are attacking the globe. This leads back to one of the few genuinely humorous traits of the film: the aliens communicating through ’80s video footage of Ronald Reagan, Madonna, and Hall & Oats. 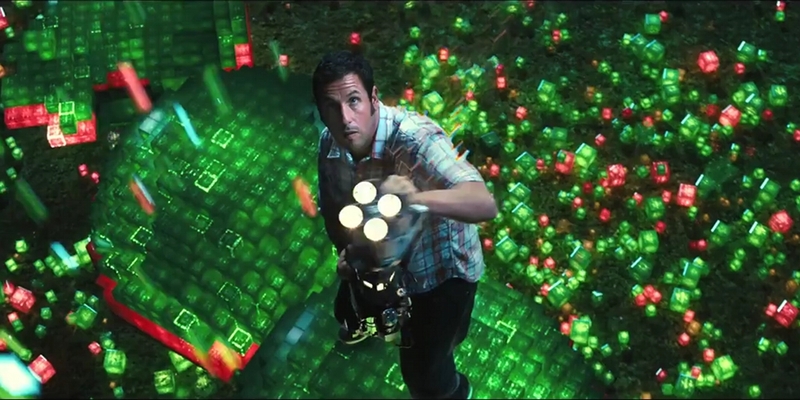 In this film, Adam Sandler appears tired of acting. His delivery is flat and he hurries through lines. It is definitely not a redeeming performance for Sandler. The rest of the cast doesn’t pull through in his stead, either. Gad has some funny lines, but it appears that all of his lines were written with the caps lock on. The number of punchlines that he straight up screams at the top of his lungs is surprisingly high, and it does not serve a more comedic result. Dinklage’s talent is wasted on an exceedingly annoying character. Eddie is armed to the teeth with an unbearable accent and cheesy lingo. It is grating just to hear him speak. Similarly grating is the sound of the action sequences. The sound effects are overbearing, and the visuals are simply unappealing. Flying 8-bit creatures are jarring as they scream around the screen and shatter objects and people into waterfalls of shimmering blocks. The 3D effects don’t help to up the overall aesthetic, either. All that the 3D accomplishes is spraying a wall of pixels into your face so entire action sequences get distorted and less engaging. The premise of Pixels is novel. The notion of playing real life arcade games against aliens is truly an interesting and original idea. However, the pitch is mismanaged with poor writing and headache-inducing audiovisual effects. The funniest aspects of this movie are Pac-Man creator Toru Iwatani (portrayed in the film by Denis Akiyama) trying to tame his giant yellow child and Matt Lintz, the child actor whose comedy timing easily matches Sandler’s in their shared scenes. The Pac-Man scene is easily the funniest moment in the movie. Too bad it was wasted in the trailer. 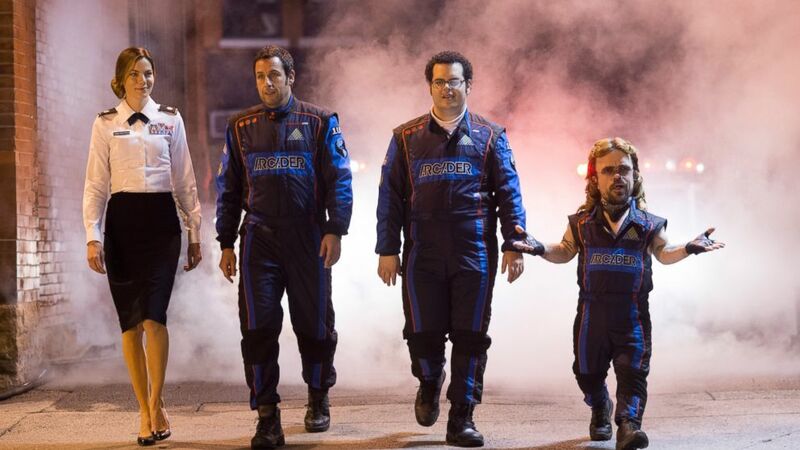 Pixels had one leg to stand on with its premise, but it swept that leg out from under itself with poor comedic timing and lackluster scripting. Some of the funniest moments come in the form of a barrage of ’80s pop culture references that easily fly over the heads of the PG-13 demographic that the film is trying to hit. Nothing memorable comes out of this flop of an action comedy. Have you seen Pixels? If so, what did you think? Let me know in the comments!